Johnjo, Bill, David and Neil reached the quarter-finals of the Edinburgh Seniors at Murrayfied last the weekend. In their section games they peeled four all with Alan Durno; lost 10-3 to Norman Brown before beating John Dignan 7-6 and Jim Hogg 11-3. In the knock-out stages they came unstuck at the first hurdle going down 3-1 to Ken Horton. 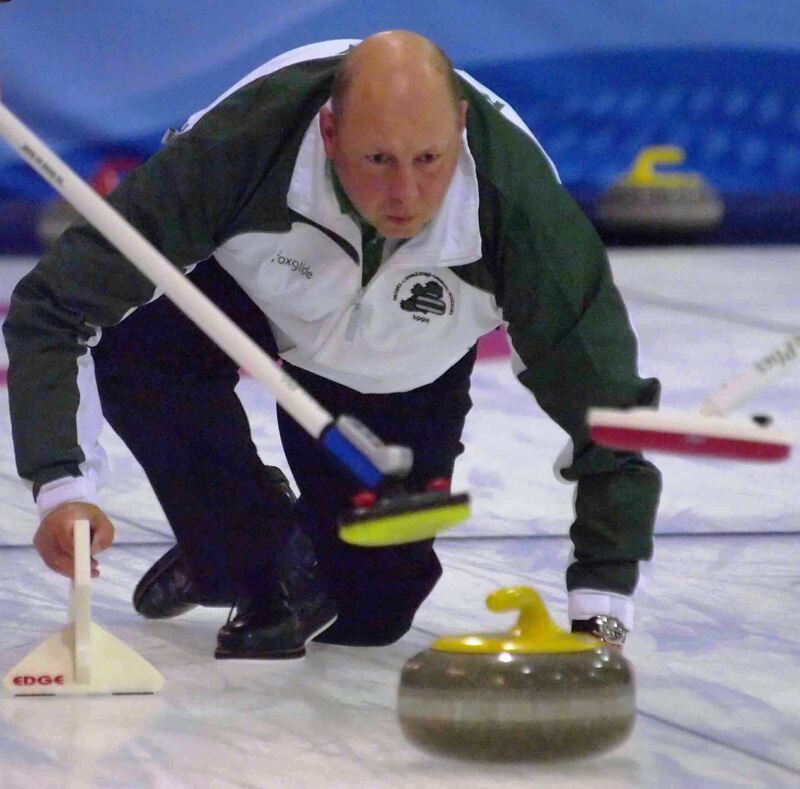 Johnjo Kenny, Bill Gray, David Whyte and Neil Fyfe are representing Ireland at the Edinburgh Seniors International at Murrayfield Ice Rink this weekend. They are in Section A and their first game is12.30pm today (Friday 21st) against Alan Durno. They will then play again today at 6pm. Tomorrow they are drawn at 9am and 2.30pm. If they get through to the knock-out stages, the semi-final will be on Sunday at 12noon and the final is at 3pm. Good luck to Team Kenny! 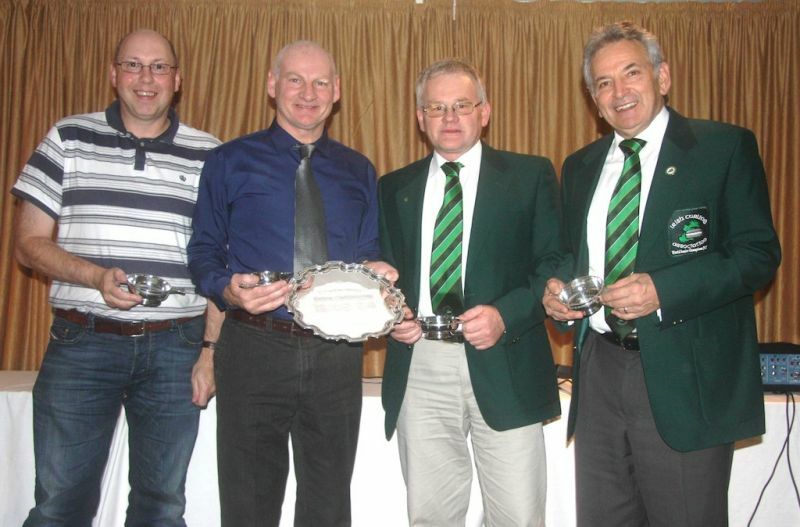 Having completed an open-topped bus tour of the Republic and appeared on The Late, Late Show, the skip of Ireland’s recently crowned European Senior curling champions finally had time to refect on his team’s victory in the Greenacres Invitation. Robin Gray said: “I have to admit to being surprised at winning the competition primarily as the back end of the team have done no curling since early in the 2013/4 season. Its funny how often the new entrants to seniors in a number of sports appear to enjoy initial success on turning 50! “We were rusty in closing out the opening game against England, but as the second game against Sweden wore on, I began to realise that we were all playing at a fairly competent level and that generally sustained and improved during the week. Our strategy was to play the entire week on a single guard where possible and keep it simple, and on the whole that worked. We executed it extremely well in the Sweden and Scotland round robin games, the latter which was our best. We only came unstuck in the final when temptation to guddle got the better of me and that turned out to be a very aggressive matchup in strategy. Through some great shotplay, we came out the right side of that but often could have been in trouble. “The downside of that simple strategy is that close games are likely, and we had five last stone deciders out of the eight games. To win all of these would not happen all of the time, but last weekend we had the hammer in all and made it count. I think the ice suited us, the draw weight was on the slow side of average, swings were good but not crazy and that all works well for me. Team Gray with their prizes. 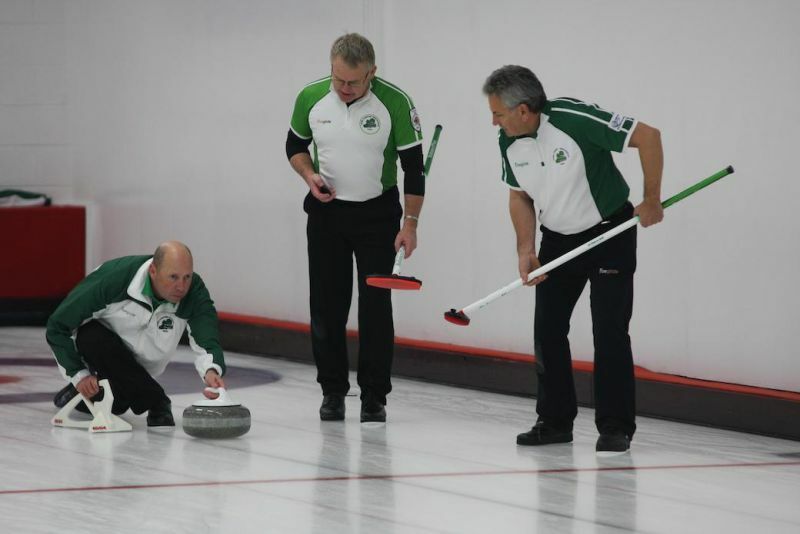 Having been given a wildcard entry into the competition, Team Gray, representing Ireland, did a bit of a Goran Ivanisevic by winning the Greenacres European Senior Invitation Curling Championships when beating Team Prentice from Scotland 6-3 in this afternoon’s final. 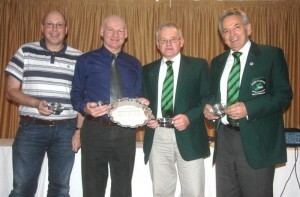 The Irish team – Robin Gray, Peter Wilson, PJ Wilson and Tony Tierney – were playing their first competition together and ended their eight-game run as the only male unbeaten team. Well done to our Irish team! Ireland’s Robin Gray, Peter Wilson, PJ Wilson and Tony Tierney beat the Swiss rink skipped by Karl Grossman 6-5 after an extra end to go into this afternoon’s European Invitation Seniors final at Greenacres Ice Rink. They play Keith Prentice from Scotland – again. Get along to Greenacres if you can and cheer our boys in green on! Both the Irish teams played their fifth and final round-robin game in the morning. On sheet A, in the red section, there was the clash of the ice-road trucker juggernauts, Ireland’s Robin Gray and Scotland’s Keith Prentice. This was not a game for shrinking violets with as much testosterone bouncing off the walls as a Navy Seal convention. Team Gray came out on top after eight intense ends of curling by six shots to four. 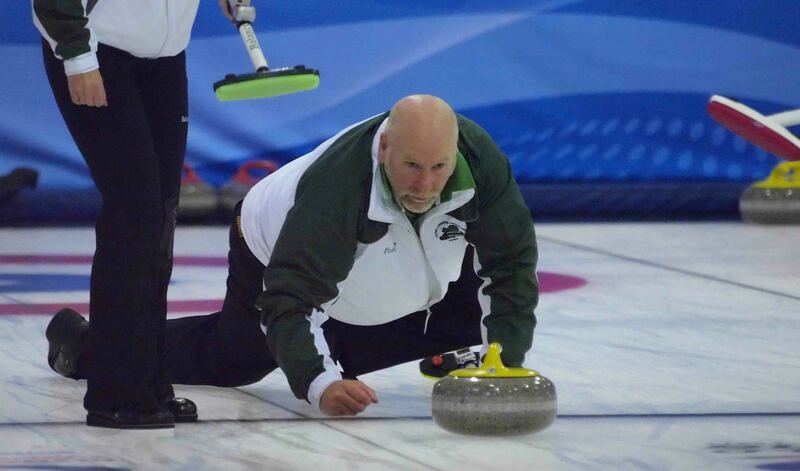 This victory put down a marker that this new Irish team are a force to be reckoned with in senior curling. Through the back of Greenacres, on sheet E, in the blue section, Team Kenny from Ireland were playing one of the most bizarre games ever against Russia’s Sergey Korolenko. On what JJ said was a challenging sheet of ice (I paraphrase) the Irish boys found themselves 6-0 down after four ends. They then scored a five, a three, a four and a two to win 12-6! “Never again” said the skip afterwards. And we all thought football was the game of two halves. Team Gray went on to win their quarter-final 7-3 in the evening against Gus Van Imhoff from The Netherlands to go into Saturday morning’s semi-finals. Good luck to our boys in green! Day 2 of the Invitation Seniors at Greenacres Ice Rink saw Ireland’s Robin Gray, Peter Wilson, PJ Wilson and Tony Tierney, in the red section, soundly cuff Italy’s Valter Bruno 10-3 in the morning session before battling it our for their second peel of the competition after ending up four all with Switzerland’s Hans-Jorg Bless. 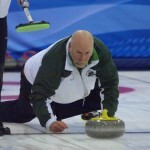 In the blue section, Johnjo Kenny, Bill Gray, David Whyte and Neil Fyfe came back to something like their usual form when out-curling that section’s hot team from Latvia skipped by Peteris Sveisbergs, 7-3. With their tails up, they went into the evening session against Scotland’s Ken Horton with confidence restored but pushing for the win they needed backfired on them and they went down 7-2. Johnjo said afterwards: “We played a near flawless game against section leaders Latvia in the morning running out comfortable winners but our evening game against Ken Horton was decided on the finest of margins as we opted to go for the win necessitated by our poor Wednesday rather than the straight forward “peel’ in our last end. And they say fortune favours the brave! Ireland’s two men’s teams had mixed fortunes at the first day of the European Invitation Senior Championships at Greenacres Ice Rink. After two games, Team Gray are yet to taste defeat while team Kenny are yet to taste victory. In the early morning session Team Gray had a testing eight ends against Tommy Campbell’s experienced English seniors team but secured a victory by seven shots to five. In the afternoon they went head to head with world senior silver medallists Connie Oslund’s team from Sweden. By all accounts this was an enthralling game for the spectators and Team Gray had to take a one in the last end for the peel. Top of their section is Scotland’s Keith Prentice on two wins. In their section, Team Kenny struggled to find their best game going down 6-4 to Gus Van Imhoff from The Netherlands in the morning. They were also on the wrong side of two shots later in day when Sweden’s Mats Nyberg skipped his team to an 8-6 win. Team Sveisbergs from Latvia heads that group on four points. Two of Ireland’s Mens senior teams are taking part in the seventh Greenacres European Senior Invitation Curling Championship this week from Wed 5th to Friday 7th November. They are skipped by JohnJo Kenny and Robin Gray.